Black or white? Heart or mind? Sweet or sour? Sugar or salt? These are the normal life question we succumb to quite often. However, these questions or their answers won’t directly affect your Rs. 1 lakh business but, creating and launching a right product will! Thus, A/B testing your product is essential and doing it the correct way is all the more essential. 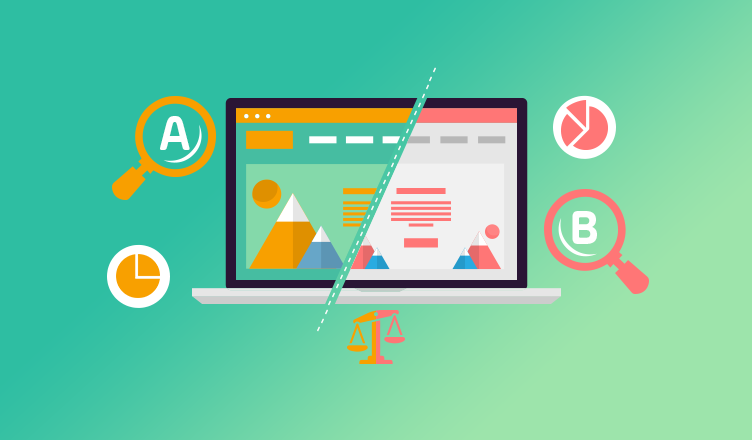 So, what is A/B testing all about and how it works? Read on to know more and explore your product’s or service’s true potential. Basically, A/B testing also known as ‘split testing’ is comparing 2 different versions of the same product or service. The one which is more suited or the winner, is pushed ahead for the launch. Now Gaurang knows/you know which product version was liked by the existing audiences. Also, being in a similar horizon, increasing new users is a definite. Just the way Gaurang had a clear-cut goal before he set out, it is important to know the reason why you want to do A/B testing. A/B testing is to understand what works and why. Hence, it is a good idea to have all your database groups, product version, and other tools ready. Also, select a good date range to collect accurate data of webpage or email performance. Headline: Is it catchy and inspiring users to click? Images: Are they optimized, well fitted and attractive? If yes, then you have passed this test! Call to Action (CTA): A compelling CTA is the source of signups along with the above elements. Make sure your CTAs are mentioned at least 2-3 places in the entire page. Links: Check if your links are trackable. Tracking makes sure that you are aware of how many people clicked and where. Choose the variant that you want to test (for example CTA) and zero it down to what feature you want to test (Size, Color, Text or Placement). The way your audience is split is based on what you are testing. If you are A/B testing emails, then you can control who your audience is. You will get an accurate result within a short period when your audience is split into two groups equally and randomly. But with a webpage, you will have to run the test for a considerable period to get an accurate result. Pro-tip: At a time run only one A/B test. This measure will prevent confusion of which test is driving traffic or conversions. Anything good takes time and running the test for a considerable period will give you an apt result. The time to run A/B test will vary from one organization to another, based on the number of people who are involved in it. Run any A/B test at least for a period of 2 business cycles. This is because when you stop a test in between many times you might jump to a false conclusion and thereby ruin the reason for the test. Pro-Tip: Run your test long enough so you can actually differentiate between the two variations. How To Measure Your A/B Test Results? There are plenty of A/B testing tools available in the market. Some of them provide the same service for free or charge a price for the same service. Tools seem essential as they are automated, time-saving and above all instant result curating. Here are some of the best tools available in the market: Adobe Target, Google Optimizer, and Optimizely. You choose your pick and get started with your work. Once you run the test, it’s time to read the results! Consider that your result of A/B testing is something like this: Group A gives 20% while Group B gives 23%. if yes, then go ahead with it. If no, then go back to the original one. Don’t lose hope here. Going back to the older version is not giving up. Take this as an inspiration to create something more better and epic. Focusing on too many results at the same time. Before you look at the report decide on what result you want to know. Not re-testing. This might give you false results. A/B testing has been widely used by businesses to figure out that one factor that converts a visitor to a customer. When you run this test for a considerable time, you can gather enough data to make strategic decisions. But the key to unlocking this treasure is being consistent, with proper planning and execution. Follow these steps mentioned above to successfully kickstart A/B testing today. With all your marketing efforts for your business in place, it’s a good idea to have an all – in- one payment solution in place as well. Now enjoy the best payment gateway experience and grow your business effortlessly!